Search in all sections because multiple records exist. Do not use special characters i.e. : use Francois not François. Date of death search in the Rhodesian Roll of Honour section must be formatted in this manner 22/07/1977 if you are searching on 22 July 1977. You can also search on date of death for a particular day in history eg: if you put 22/07 you will get all deaths recorded on 22 July covering all years on record. A number of dates of death are unknown, therefore to search for these enter Unknown in the date of death search field and press search. 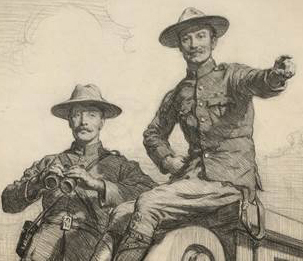 Lord Cecil Manners with Colonel Robert Baden Powell pointing to something of interest during the Anglo Boer War.